Top 5 Extend is the premium grazing mixture for 2016. Top 5 Extend contains the highest performing varieties on the Pasture Proﬁt Index list. The varieties selected for this mixture excel in spring growth and quality – meeting the demands of intensive grassland farmers. Top 5 Extend is designed to achieve high animal performance through its exceptional quality values and extend the grazing season with high spring and autumn growth rates. 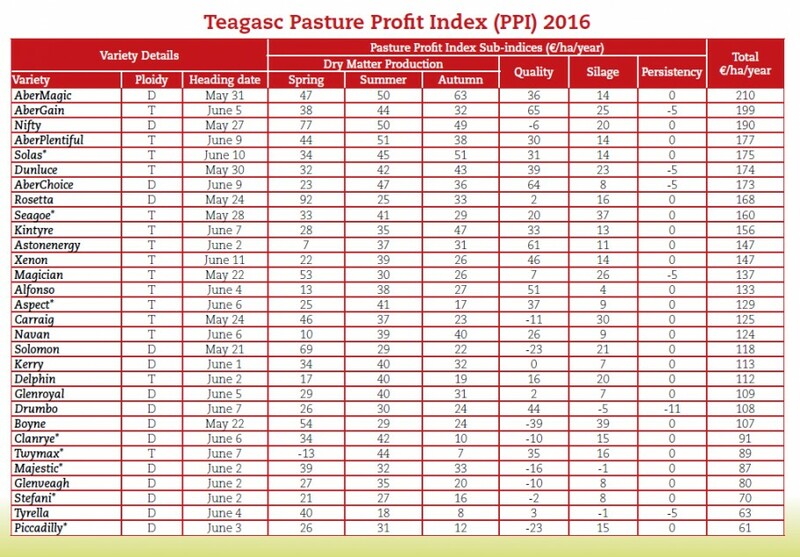 Teagasc and DAFM have released the 2015 Pasture Proﬁt Index (PPI) which ranks varieties on their total economic merit. The purpose of the PPI is to assist grassland farmers to identify the best perennial ryegrass cultivars for their farm. The PPI quantiﬁes the value of variety in € per ha/year. The sub-indices present the opportunity to farmers to examine the performance of varieties across the most important traits.